What happened to us since the summer? Here are a few highlights. At the end of September, three of us attended three different event during the same weekend: the ATRI conference in Toronto (Association of Treasurers of Religious Institutes), the Plenary Assembly of the CCCB (Canadian Conference of Catholic Bishops) in St Adele, Quebec and a conference to celebrate the 50th anniversary of the Second Vatican Council called “Vatican II for the Next Generation”, held in St Paul University in Ottawa. In different ways, these events enriched our understanding of the life of the Church in Canada. We all came back very energized by the meetings and what we learned, and renewed in our desire to live out the mission in Canada. For Thanksgiving, we welcomed two of our friends from Quebec over the weekend. As potential associates of our community, they are currently getting to know better our foundress Claire Monestes and we are amazed and grateful for the bond they discover with her and her spiritual journey. We all enjoyed showing them around Toronto, praying together, sharing our community life and… the Thanksgiving dinner. At the end of November, on the occasion of the visit of Mireille, one of our general counsellors from France, we met with our sisters from the community of Montreal. The gathering, aimed at reflecting on our mission in Canada, took place in Ottawa. We are very grateful for the hospitality and kindness of the Sisters of the Sacred Heart of Jesus (link) who welcomed us in their convent. Friends and neighbours joined us for another evening of prayer during the season of Advent. These “open prayers” at our place are simple and powerful. All who participate enjoy singing hymns and psalms, listening together to the Word of God in the Scriptures, interceding for the world. It turns us all into a community of prayer, support and friendship and we are grateful for that. We had a 3-day retreat between Christmas and the New Year. The theme we had chosen was “God’s revelation to us: Christmas”. Two of us shared a reflection about the theme based on readings or courses they had attended. One talk was about Dei Verbum as presented by Christoph Theobald sj in his book Dans les traces de Vatican II: Dei Verbum. The other talk was about understanding Revelation through the contribution of Bernard Lonergan’s Method in Theology. After very busy weeks during the Fall and at Christmas, it was good to enjoy silence, personal and community prayer, walks in High Park, and relaxing and resting in the Lord. February 14 is an important date for us. Not just because it is Valentine’s day! This date is one of our community feast days as it marks the anniversary of the death of our foundress Claire Monestes in 1939. Choosing some of her quotes to celebrate this feast in a prayer service led us to appreciate again how the depth and strength of her spiritual insights still appeal to us today. Claire Monestes’ spiritual legacy will be at the core of our upcoming Jubilee year which starts this Summer. 50 years! let’s celebrate! On June 20, 1963 the Church granted our institute of the Xaviere, missionary of Christ Jesus, the official recognition as a religious order. To mark the 50th anniversary of this event in 2013, we are embarking in a Jubilee year of spiritual renewal and celebration. Stay tuned for updates and pray for us! Summer is here: sunny and pretty hot in Toronto so far. What’s new for us these days? Work goes on; with daily rides on the TTC and no real slow down in terms of projects and things to do. 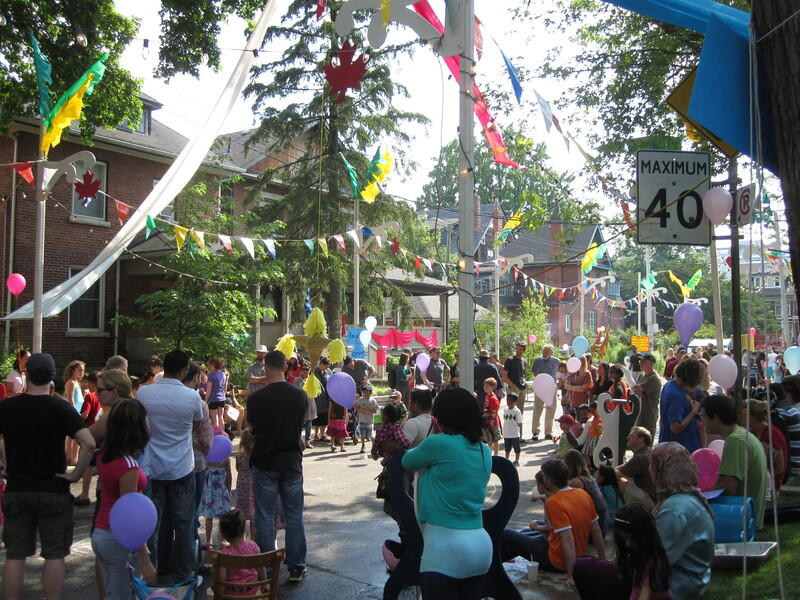 There are lots of events going on in town including the annual street party. The barbecue season is definitely on and while we don’t have one (yet), we have enjoyed a few either with friends, colleagues and fellow religious. The Sunnyside outdoor pool is open again and that’s great! The bike ride to there through High Park keeps us in shape! For one of us, the summer will see the relocation of her office from downtown to Mississauga. Even if the expected change in the working environment and the longer commute are a source of concern, let’s hope newness will also bring about good surprises. Vacations are also in sight for most of us. Some will go to France will visit family and friends in Paris, in Tullins near Grenoble, in Vence near Nice and in Toulouse. They will be able to attend the community gatherings taking place in La Pourrraque in the south of France. There, the Xaviere sisters living in Chad, Cameroon, Ivory Coast, France and Canada have a chance to meet, rest and celebrate. Check out the link and you will see why this house is so special for us! One of us will stay in Canada and her vacation will include her retreat in Loyola House in Guelph. One of us started a new job in February and will not be able to take some time off. She really appreciates the long weekends (as we all do). During the summer some Xavieres will take new steps in their religious life, entering the noviciate, taking their first vows, renewing them of doing their final profession. We give thanks to God in anticipation for all these events! We hope you are having a great summer. May it be restful, playful and filled with God’s abiding presence!